You’ve probably heard competing claims about social media’s impact on Google search rankings, and there’s a good reason for that confusion. The truth is that, even though SEO and social media don’t work together in the traditional sense, they still have a powerful relationship that’s easy to overlook. So why the confusion? 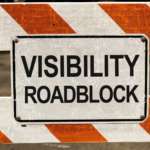 Google itself has repeatedly stated that social media posts and social shares aren’t ranking signals, because there are too many social posts to fully index and because shared links are labeled “nofollow.” Having more links point to your website usually increases your overall placement in search engine result pages, but “nofollow” links are ignored by Google’s algorithm. Despite this, some have claimed to see underlying patterns between social media shares and search presence, and others have even outright theorized that Google ignores “nofollow” labels on high profile websites. Tinfoil hats aside, it’s impossible for the common web browser or SEO practitioner to know what exactly goes into Google’s closely guarded, ever-changing ranking algorithm. So when it comes to social media and SEO, it’s safer to stick with what we do know: social media is a valuable brand-building, reputation-boosting, and audience-interfacing tool that should be part of your larger SEO strategy. Even though individual posts may not rank on Google, your main social media brand page will. (We say Google, because Bing does use social metrics, particularly the follower count of the user who shares a link, as a ranking factor.) This is easy to see for yourself: just search for any major company. 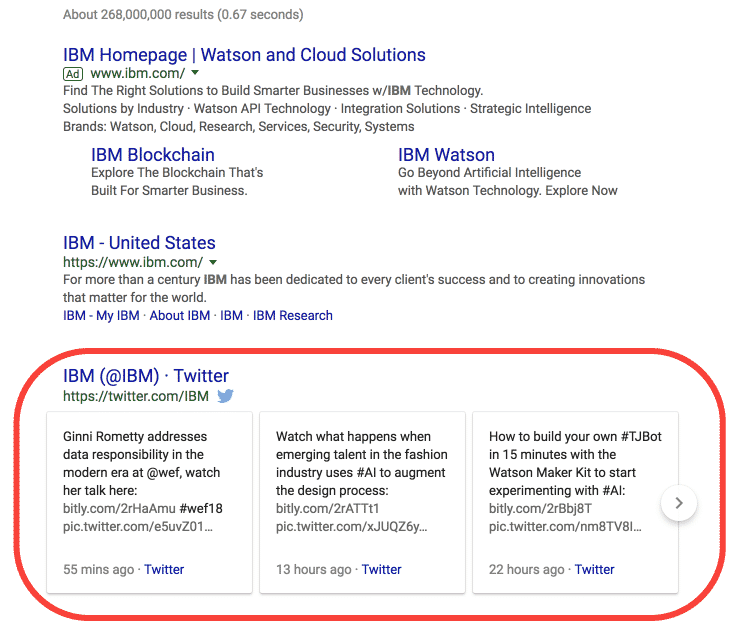 You’ll doubtlessly find their Facebook, Twitter, Instagram or Pinterest profile pages (not to mention individual tweets in cards on Google’s search results page, if they are on Twitter). So how can you improve your brand’s social profile page rankings? The answer is straightforward: get more followers. You need to regularly push out timely and relevant content that will encourage shares, likes, and follows. It may feel intimidating to post fresh content daily (if not bi- or tri-daily), but adopting the “80-20” rule of content sharing can make it easier. The 80-20 rule of social media marketing is simple: 80% of your shared content should be entertaining or informal, and it can often be shared from other sources. The other 20% is the promotional, purely original stuff that’ll help drive immediate conversions. Converting becomes even easier when you link early and often from your brand’s social media pages. Once your posting strategy draws followers, and your brand’s social profiles are ranking on Google, you’ll want to spur visitors to act beyond their social entertainment with a compelling call to action. Most of the major social platforms offer all sorts of options to make your call to action more clickable, especially if you’re willing to pay. However, there are still popular platforms that don’t allow linking in organic posts (cough–Instagram–cough). Keep that in mind when planning your campaigns. If all this abstract branding doesn’t whet your appetite for social media SEO, rest assured that there’s still a place for your lovingly-researched keyword phrases on social, too. 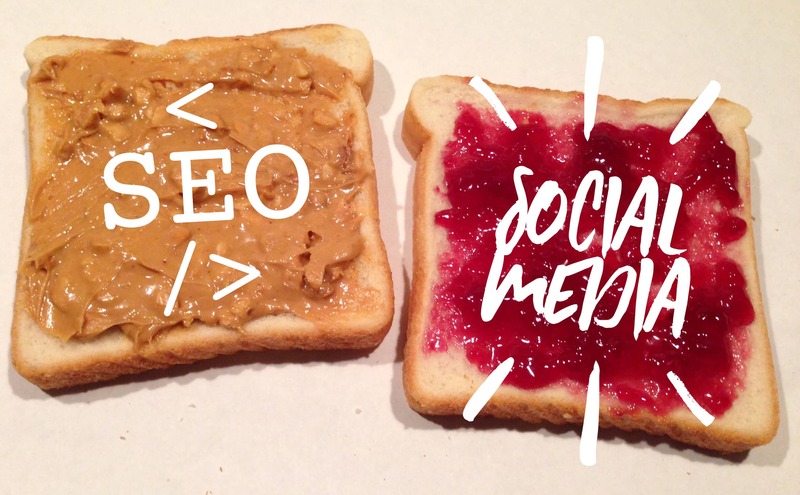 As QuickSprout’s Neil Patel points out, social media optimization is SEO. We’re used to associating SEO with Google and Bing, but Facebook, Twitter, and Instagram all have robust search tools that follow similar algorithms. By writing your brand’s page copy and post content in a way that’s driven by keyword research (and maybe a couple of carefully considered hashtags), you can draw in any number of Facebook’s 2 billion plus daily searchers. Winning keyword phrases start with a thorough audience understanding. BuzzSumo is a powerful tool that lets you see the most shared content pieces in any subject area, even with the free version. Try using their content explorer with any topic—whether it’s SEO, tennis, or Stranger Things—and you’ll see that topic’s top trending content pieces on every major social media platform, as well as their backlinks, too. It’s pretty easy to pick up ideas for keyword phrases just by keeping an eye on top article trends. Or, you can get more scientific by downloading the article titles into a spreadsheet and tracking popular terms. Cross reference that with ideas from keyword generators, such as Ubersuggest and Answer the Public, and you can piece together unique, long-tail keyword phrases for your social content strategy. Bonus points if you use Google’s Keyword Planner to “check your work” and find the phrases that are really generating impressive search volumes. Are Instagram visitors clicking through every page of your brand’s photo album but going no further? Stimulate these grazers with informative product descriptions and purpose statements in each photo’s caption, and then share those photos and captions on your Instagram page itself. Are Facebook visitors getting hung up on your site’s shopping cart page? Start using exclusive coupons and referral codes in your Facebook posts for a price-conscious audience. Be patient! Implementing these insightful tips may not immediately boost your website’s SEO. But, you’ll be creating valuable, targeted content that users, bloggers, and influencers will want to share. More importantly, this yin-yang relationship between social media and onsite content will give your brand a cohesive voice that your target audience will recognize and remember. Learn more about how well planned social media marketing can help your site’s content strategy and search rankings.